I went into the weekend with a plan. It's my “other” Grandmother's birthday this week and I wanted to make something special for her. (I say “other” because I have yet to mention her). I've discovered over the years that my Grandmother loves banana bread (which is great, since I love it too). However, I've made her plenty of banana bread in the past and wanted to do something different, but I knew that bananas would be involved. The other essential ingredient was peanut butter. My Grandmother is another peanut butter spoon eater, and further proof that my ongoing obsession is genetic :). With these flavours as my base I determined that the best outlet would be in cupcake form. I began the process of vetting banana cupcake recipes but they all seemed to have too many ingredients or larger ratios of fats and sugars than I felt necessary. 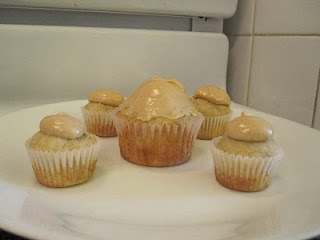 I found Peanut Butter Banana Cupcakes in my bookmarks with an ingredient list I felt good about. And with a Shyamalan like twist, decided to remove the peanut butter. I wanted two distinct flavours to meld together and preferred the idea of a pure banana cupcake paired with a peanut butter icing. I felt that peanut butter in the cake itself would confuse the taste. I figured the most graceful way to remove the peanut butter was to substitute it with a few tablespoons of oil (I call this "calculated risk" :) ). And because I rarely find a full cup of sugar is required in a recipe of this size, I reduced it a bit. Besides, my fresh from the freezer bananas are always more than sweet enough. I also tossed in some vanilla (I'm a sucker for the classics) and a bit of nutmeg, as both work well with banana (in my opinion). The batter was ready and in the oven in record time so I went to work on my chosen icing recipe. When finished I took a taste and nearly choked on its sweetness. The icing was wretched. The peanut butter was not at all noticeable and seemed to exist only for colour. Panic stricken I searched for something else. Not liking anything I found (too much icing sugar, which I now believe is only for french toast), I thought back to how much I enjoyed the cooked frosting from my “Red Velvet” cupcakes and chose to use it as my base. I hadn't planned on needing anymore butter so none was softened. Mad scientist that I am, I (once again) replaced all the butter with peanut butter. This was a peanut butter icing after all. Adding to my current stress was the realization that I was pressed for time. I had planned on leaving for my Grandparents' house at 3PM and a quick check of the clock told me that either I was going to be late or I needed to find some plutonium (a bolt of lightening is too unreliable). Regardless, this icing had work, but first I needed it to COOL FASTER! (icing has watched pots beat any day). Impatiently, I added the *ahem* cooled flour mixture into my mixer and hoped for the best. After running the mixer for a while the icing wasn't fluffing up as much as I remembered it should. I wasn't sure if the reason was the peanut butter or the warm flour mixture. I was hoping for the latter. So in the fridge it went. Wait. Out the fridge it came. Mixer. Damn. Conclusion: peanut butter. On the plus I was able to flip the bowl without any icing dropping out (always a risky test :)). Though, more like a thick glaze (or filling) than your standard light and fluffy icing, it tasted good. Too good. Great peanut butter flavour and not too sweet. It even maintained that stick to the roof of your month feeling. In fact the flavour was so good I started eating the leftovers out of the bowl with a spoon :). Speaking of which, there was more left over than the Red Velvet icing even though the proportions were the same. I'm not sure why. Quickly, I iced a bunch of the cupcakes and off to my Grandmother's I went. Success! My personal taste test came a bit later. All I can say is that there is no doubt that these are my favourite cupcakes. By far. The cake was moist, tender and fluffy with a tonne of banana flavour. Similar (as it should be) to a banana bread, but light and pillowy. Although they were a bit sweeter than expected, it wasn't a bad sweet. 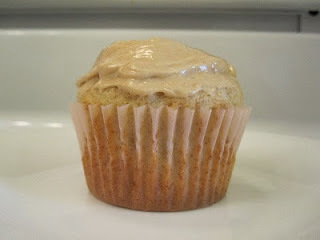 Paired with the sticky, almost gooey, peanut butter icing it was nearly a religious experience. Now, it's well known that peanut butter and banana are a great marriage of flavours that is often overshadowed by the absolutely perfect marriage of peanut butter and chocolate. After tasting these cupcakes I think peanut butter may have issued some divorce papers. And as much as I enjoyed the standard size cupcakes, these are even better as mini ones. With only a teaspoon of icing on each (I used two teaspoons on the larger ones) it was a perfect bite with a perfect combination. I will be making them this way from now on. I love these cupcakes and have had to stop myself from completely scarfing them down. The cake is terrific and I'm so happy I stumbled onto this icing. It's always nice when one of my panic attacks leads to something other than yelling and further panic.. and then some swearing.. followed by more yelling. I'm honestly not sure I can improve on these cupcakes and with two large experiments in one recipe working out, it truly is a momentous occasion. I don't know if anyone has checked the temperature in hell recently, but I swear a pig slammed into my window this morning. Preheat oven to 350F and prepare a standard muffin pan and mini muffin pan with paper liners. In a medium bowl add flour, baking powder, salt, nutmeg and whisk to combine. In the medium bowl of a mixer cream together butter and sugar until pale and fluffy. Add oil and vanilla and mix on medium speed until completely combined. Add eggs one at a time, mixing until incorporated. Add banana and mix until fully incorporated. Evenly distribute batter into prepared muffin pans and bake for 18 to 20 minutes (9 to 11 for mini) , or until toothpick comes out clean and muffin edges are just starting to brown (my time was 19 minutes for standard and 10 minutes for mini). In a small sauce pan add flour and 1/4 cup of milk and mix until combined. Add remaining milk and salt and turn burner to medium heat, whisking continuously until a paste is formed. In the small bowl of a mixer, add peanut butter and sugar and beat on medium until pale fluffy. Add the flour mixture and beat until creamy and smooth (don't worry if it doesn't look like anything is happening, it takes a while and will at least double in volume when ready. Keep in mind that frosting is thick and more glaze like). They're so good I think I imagine baking them again at least once a day :).